In honor of Father’s Day, moms share an ode to moments with their own fathers and how they see them now that they’re parents. You’re going to fall in love with these father-daughter photos. There's something about looking at old photos with our parents now that we are the parents. 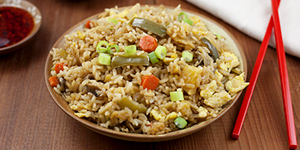 It makes us swoon, absolutely, but we think there's something more to it. There are things that we now see, notice and feel through mothering lenses like how tired they look, what they're wearing, how much love — or annoyance — they have in their eyes. Becoming a parent makes us appreciate these photos in new ways, much like the appreciation for our parents themselves changes through the years. Six women share old photos with their fathers and what they see in them now that they are mothers. Nina Badzin is a mom of four and a contributing writer to Brain, Child Magazine and Kveller who writes about family, marriage and life in general. 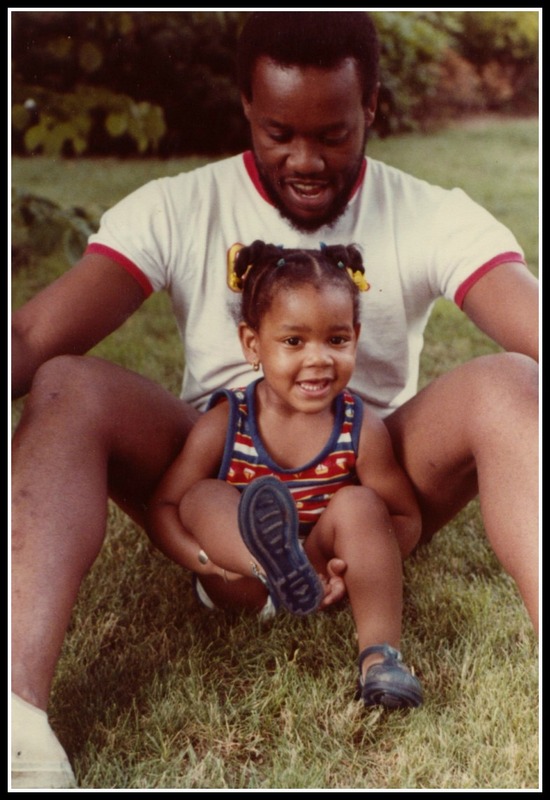 About her photo with her father, Badzin says, "I'm probably only two or three years old in this picture, so I don't remember where we were going or what we're doing. I can, however, now appreciate as a parent that all five of us are looking at the camera. I'm not exactly smiling, but I'm not crying either. My sisters are both sporting perfectly brushed hair, too. 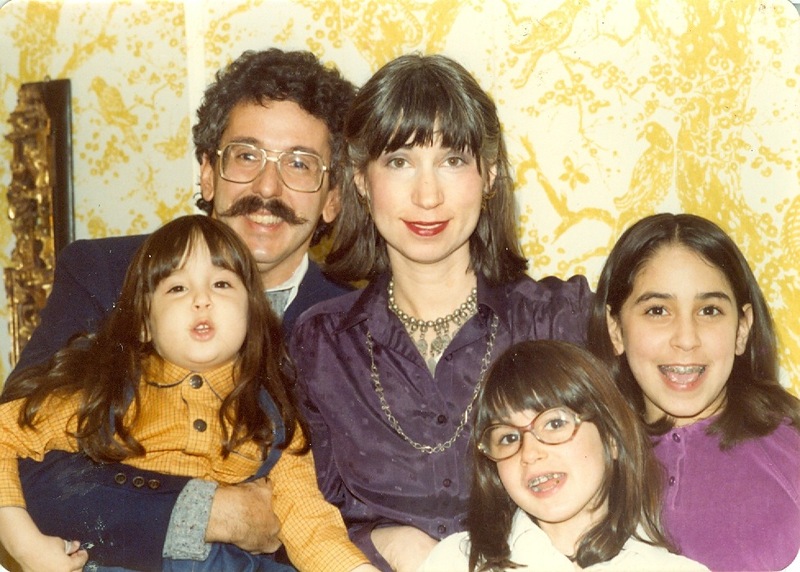 One of the things I've always loved so much about this photo is that I still see my dad as the guy with the big hair and long mustache, even though he hasn't had the stache in many years. (He does still have the big hair, but it's white now.) My dad has always been very supportive of his girls. He's our cheerleader and he's proud of everything we do. I can see that pride beaming in his eyes even in this picture, a rare one of the five of us as he was usually the one snapping the shots." Linda Wolff is the creator and writer of Carpool Goddess, a website for women where she finds the funny and the poignant in everyday life. About her photo with her father, Wolff says, "I love this photo of me and my dad — cracks and all. It was before I was a difficult and obnoxious teenager. When I still believed he was the most amazing dad on the planet. We were at a friend’s birthday party and I remember we both thought this photo would be hilarious. (It’s the '70s so make sure you check out the detail on his cuffs!) 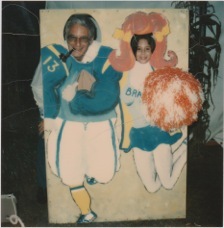 My dad never missed an opportunity to make me laugh and I find myself doing the same with my children. Looking back, I love how happy and healthy he looked. 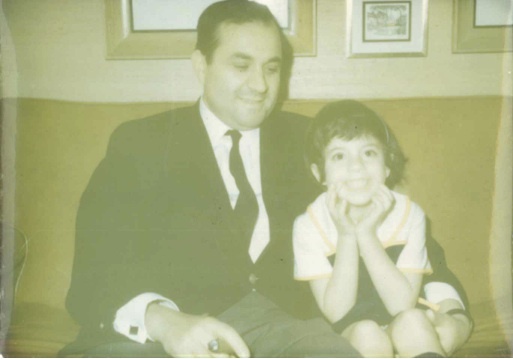 He died several years later and this is the photo of us that I cherish the most." Public relations and pop culture expert Elissa Freeman blogs at Eggs and Onions, a mishmash of PR and pop culture. About her photo with her father, Freeman says, "My dad was — and still is — a super snappy dresser. He always fancied himself as James Bond-ish, though I'm not sure James ever smoked a stogie. He was big and strong, and could even run faster than me. When he walked into a room, the energy changed. He also taught me how to shake someone's hand saying, 'Give them a firm grip and look them in the eye.' As a parent, I embody a lot of the same energy, enabling me to teach my 5'6" daughter to walk tall and with confidence. Now that she's 14, I also think it's time to teach her how to shake hands properly." Debra Cole is a writer who blogs about modern parenting (with a side of humor) at Urban Moo Cow. About her photo with her father, Cole says, "My dad and I are very similar in temperament, which means we simultaneously understand and infuriate each other. In this photo, he was younger than I am now by nearly a decade. 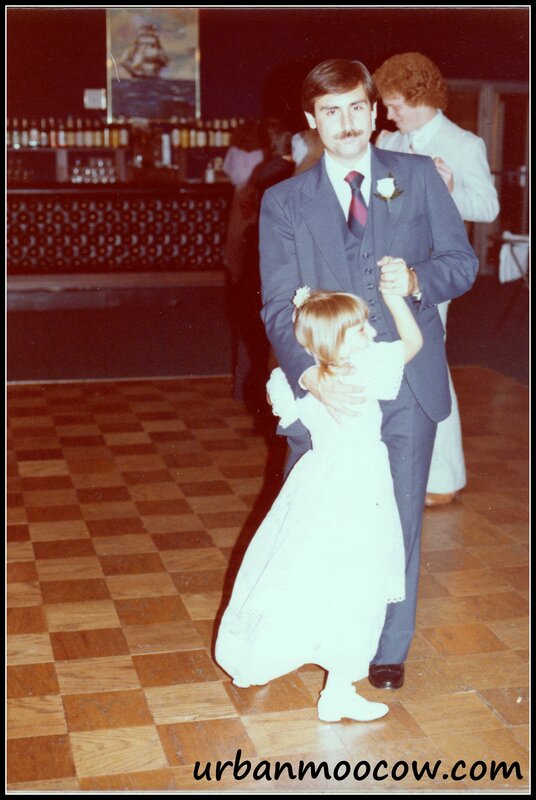 Did he imagine dancing with his little girl at her own wedding, or did that occasion still seem impossibly far away? We both cried during the father-daughter dance at my wedding. I was always in such a hurry to grow up, to move on. I understand now how bittersweet that must have been for him. With my son, I want desperately to slow down time. I will likely be in my late 60s by the time we dance at his wedding; I don’t want to skip over even a minute." Leslie Kendall Dye is a New York City-based actress, dancer, former nanny and now mother to a darling 2-year-old girl, all of which she writes about on her blog, Hungry Little Animal. About her photo with her father, Dye says, "This is the only photo I have with my father. He was a gifted photographer and thus always behind the lens. We had shoe boxes filled to the brim with prints and film negatives. (Remember film?) He also collected books and had a womb-like library overlooking our pool. His voice will forever be in my ear, breathing life into Gollum and Gandalf. I think of him as bookish and cerebral. This photo is a startling reminder that he was also an athlete. He played football and threw the javelin in college. 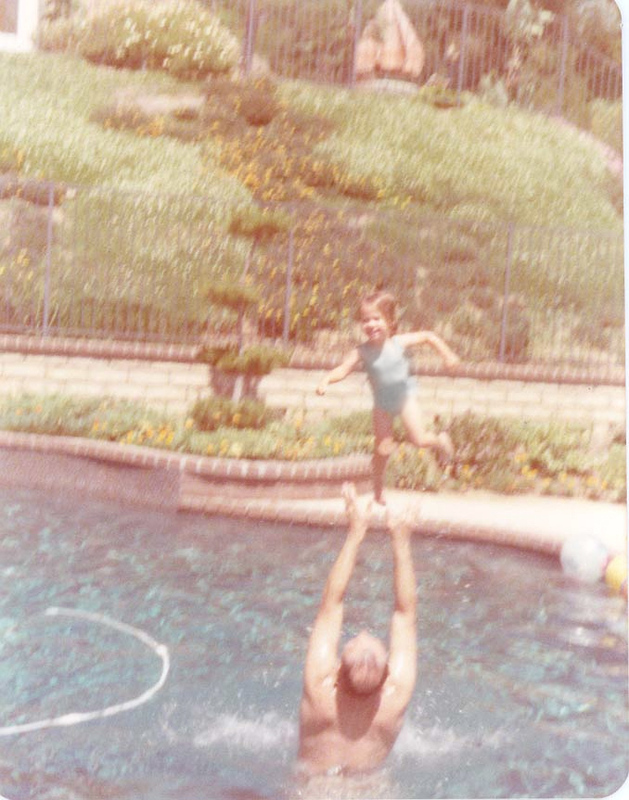 At 2 years old, I giggled gleefully as I sailed above that Southern California pool, knowing his strong arms would catch me. I carry my 2-year-old on my back around NYC. I know now that to be a parent is to be an athlete. Was my dad tired after 50 throws into the air? When his voice grew hoarse from reading one last chapter before bedtime, he never closed the book. My daughter constantly interrupts me when I am reading to her. 'No more questions, love,' I finally say. I could never understand his impatience. 'May I finish, now?' he used to say, and we knew it was time to be quiet. His look was a mock warning; a raised shaggy eyebrow indicated all the love he had for his girls, with more than a hint of the crotchety Gandalf himself." Taya Dunn Johnson writes about anything and everything while she navigates life as an expressive, vulnerable, humorous and audacious young, widowed mother of an autistic toddler. About her photo with her father, Johnson says, "The joy on both of our faces is so pure and it represents our relationship. I'm an only child and I've been a bonafide 'Daddy's Little Girl' my entire life. My dad never made parenting seem hard and I take my easy-going nature from him. Once I became a mom, I finally understood the joy that he wanted me to always feel and experience, as I want the same for my son."